PHUKET: A taxi driver from Khao Lak, the coastal tourist town in Phang Nga to the north of Phuket, this morning found his chicken and sticky rice too tasty to remember to put his handbrake on. The result being his Honda Civic plunging into the reservoir behind Phuket Rajabhat University. “I often come to Phuket to visit my brother, who lives here,” said Saner Gidjagarn, originally from Ao Luek, Krabi. “We bought fried chicken and sticky rice to eat in the car. I switched off the engine and left the windows open, but I didn’t pull on the handbrake,” he explained. 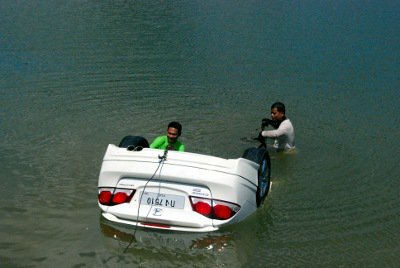 By the time the brothers noticed the car was moving, it was rolling too quickly to stop it from plunging into the reservoir. “We both decided to jump out before it went into the water,” he added. The car came to rest about 20 meters from the bank – upside down. Rescue workers from the Kusoldharm Foundation, notified of the incident at about 10am, arrived soon after to retrieve the car – much to the delight of the large crowd that had gathered to watch the rescue operation unfold. After about 20 minutes, by using a tow cable and brute manpower to turn the vehicle right way up, rescue workers managed to retrieve the vehicle.